Ruh-roh…My food budget is going to need a slight adjustment again since I discovered a new website that I’m sure will get more than a few orders from me in the coming weeks. What Republic of Tea did for my tea shelf, so, too (I’m pretty sure), will My Spice Sage do for my spice rack – which is actually not a rack, but two shelves of spicy goodness. Several recipes from three of my favorite food bloggers – Kalyn’s Kitchen, A Veggie Venture, and FatFreeVegan – call for spices I can’t get here in my little town. Basil, oregano, garlic powder, pepper, even garam masala…sure. We’ve got lots of that here. But Smoked Spanish paprika? Vindaloo curry? Chipotle pepper flakes? Nope. Not that I’d expect them to carry black lava sea salt or za’atar, but our WalMart doesn’t even carry fat-free sour cream anymore, or even Spike Seasonings, which I don’t understand. In the summer, I buy fresh herbs at our farmer’s market or raise them myself, and I love that our “health food” store carries a variety of organic dried spices. But the specialty spices are harder to find. Enter the Internet. I ordered smoked paprika, hot curry and a ground pepper today on My Spice Sage. They ship for a flat $4 rate…not bad…AND they send a free sample of some spice with each order. Apparently I’ll receive vanilla bean pods. What will I do with them? I’m not sure yet, but if you have suggestions, please let me know. I’ve said before that the best part about eating vegetarian is that it challenges me to try way more new recipes and combinations than I did when I ate meat. I’m sure if I eat meat again, I’d do the same kind of foodie exploration, but it took that plunge into vegetarianism to shake up my culinary rut. For instance, because I watch my sodium intake and in an attempt to mimic seasoned salt without the salt, I came up with this blend: 1½ t each of chili powder, paprika, onion powder and garlic powder, ½ t turmeric, ¼ t ground pepper, and 1½ t celery seed. I’ll back off on the celery seed next time because it’s a little overpowering. I use this mostly on roasted Brussels sprouts, cauliflower, and sweet potatoes. I also make Italian seasoning that I use in soups and sauces. It’s easy and cheap since I have all the ingredients anyway. Mix in a grinder (or use a mortar…sadly, one of the kitchen gadgets I don’t own) the following ingredients: 3 T each of dried basil, dried oregano, and dried parsley, 1 T garlic powder, 1 t each of onion powder, dried thyme and dried rosemary, and ¼ t each pepper, sage, fennel seed and red pepper flakes. Store in an airtight container for up to six months. I love Emeril’s Creole Seasoning. Mix 2½ T paprika, 2 T each of salt and garlic powder, and 1 T each of black pepper, onion powder, cayenne pepper, dried oregano and dried thyme. Store in an airtight container. I use it in rice recipes, crab and salmon cakes, and one of Larry’s favorites: catfish nuggets. My friend Katina makes a ROCKIN’ spread for all types of burgers (including the veggie and bean kind!) or wraps. Mix 1/3 C light or fat-free Miracle Whip, ¾ t paprika, ¼ t each of cumin, garlic powder and lemon juice, 1/8 t each of cayenne pepper and oregano, a pinch of salt and a pinch of sweetener or sugar. My spice obsession will not drain the bank, but two shelves may not be enough space in the upcoming months, now that I’ve discovered My Spice Sage. What are your “must have” spices? This entry was posted in Uncategorized on February 28, 2010 by Lynn Haraldson. I love McCormick's Salt-free Garlic and Herb. I put it on everything – eggs, sandwiches, veggies, etc. Awesome! make your own vanilla extract! Soak 2 beans in 4 oz vodka. Simple. Leave it soaking at least 4 weeks, shaking every week. It will last indefinitely. As you use it, add more vodka. I've been making my own extract for 3 years and love it. Like Sunny said – Penzeys is awesome! When we live in IL, we could drive to a retail Penzey's and I loved it. My must have spices are whole nutmeg nuts, pumpkin pie spice, cinnamon, cayenne pepper and lemon pepper. Thank you for the spice blend recipes… and for examples of how to use them. I want to try the one for salmon cakes. My current favorite spice blend, that I LOVE, and use every day is “Bragg Organic Sprinkle, 24 Herbs & Spices Seasoning”. It is salt free, and has: rosemary, onion powder, garlic, thyme, red bell pepper, carrot, tomato, black pepper, basil, parsley, tarragon, lemon peel, orange peel, celery seed, dill seed, oregano, savory, sage,ginger, coriander, bay leaf, turmeric… yummo! I'm such a pitiful cook. I just sprinkle some oregano on most foods and call it done. 🙂 Unless it's something I'm declaring as dessert, and then it gets a sprinkle of cinnamon. *sigh* I do have a few other spices, but I rarely use them. I love spices! I have so many that I use often. These are: Chipotle Chile Powder, Ancho Chile Pepper, Cocoa Chile Blend, Smoked Paprika, Cayenne Pepper, Poppy Seeds, Sesame Seeds, Celery Seeds and so many more. I must organize them again. I would love for everything to be as neat as your cabinet! Late to the comments, but I already plugged Penzeys on you FB page. Once you place an order with them, you will get their monthly catalog that not only has all of their products, but wonderful recipes as well. I am always very inspired to get cooking when their catalog arrives in my mailbox! I'm definitely checking out Penzeys. And Anonymous…I love McCormick's because they have an awesome policy about how they buy their spices. Annimal…you're back! Haven't seen you in awhile. Thank you for the vanilla extract recipe! I promise I'll try it and let you know how it comes out. I had no idea it was made with vodka. Rettakat, I've seen Bragg at the local health food store. I look for it. Ooh, that vanilla recipe sounds fun. I have some from Mexico that my traveling friends have brought me, but when it runs out I am going to try that! I don't think I use any unusual spices. I know garlic is not a spice, but buying it already minced in a jar is one of my most favorite things to keep on hand. 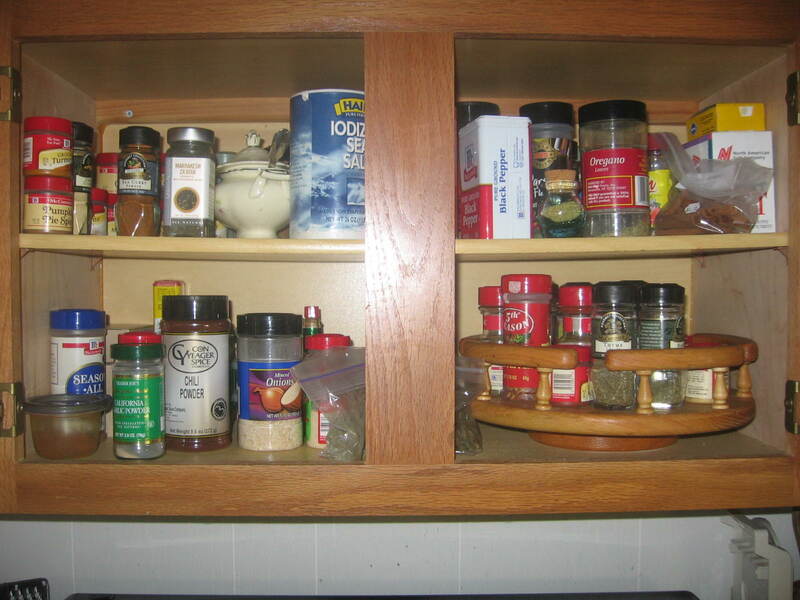 I have a little container with all those spices I use to make my chai tea blend–cardamom, anise, allspice, etc. Plain old cinnamon makes it into an awful lot of my food! Oh, and Lynn, I am so glad you have a search tool on your blog. I always have to check back on how you cook your roasted cauliflower because it is just right if I follow your directions! Guess what I'm having for dinner tonight? Along with some Roasted tomato soup–seemed like a good pairing to me. Hi Lynn! I have been following your blog ever since we chatted months ago in preparation for your Today Show segment. Thanks for the spices tip. I love to cook and was not familiar with this spice store. My personal favorites are cardamom (for smoothies, oatmeal, etc.) and smoked paprika (great in spice rubs and chilis). As for those vanilla beans, use them well, they're expensive! I would scrape out the seeds (I think it's called vanilla caviar–how cool is that) and add them to part skim or nonfat ricotta cheese with a sprinkle of sugar/sugar substitute. Beat the ricotta on high speed until it's light and fluffy. Serve with fresh fruit. YUM!! Johannah, so good to see you here! And cardamom in a smoothie? I need more info. I love cardamom. I'll try your vanilla bean suggestion, too. I've got some leftover ricotta in the fridge that I wasn't sure what to do with. Not enough for manicotti, you know? Hope you're well! I usually add ground cardamom (though I suppose you could use the whole pods?) to a smoothie made with frozen bananas and nonfat yogurt. It's actually based off of one of the smoothie recipes in Joy's book Your Inner Skinny. Really, really tasty. Wish I had one to drink right now!